Peter Galbert’s chairs are unique. They are a mixture of time-honored methods & materials blended with Peter’s desire to bring forth a range of aesthetics in his finished work. Some of these are quite tangible, as in the way his chairs envelope and support the sitter into an almost dream-like state of comfort, while others are less so, like the interplay of light and shadow on a sculpted component that lingers as a pleasant after-taste in the mind’s eye. Peter’s ability to take the best of the past that works and partner it with fresh ways of seeing form and function are what make him such an exciting chairmaker and craftsman. Add to this Peter’s extraordinary ability to convey information as a teacher and you know why we’re incredibly pleased for Peter to conduct chairmaking classes at Highland Woodworking. 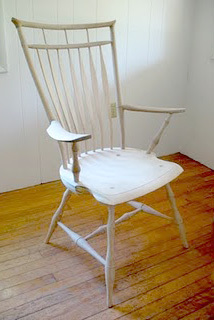 Peter returns this fall to Highland Woodworking for a week long chair making class to Build a continuous arm Windsor chair. Space is limited so confirm your seat in the class soon. Discover more about the Windsor chair “design mind” of Peter Galbert in his article, linked below.